The 2 Month dry erase calendar is great because it lets you keep track of this month and next month at the same time. The boards are all made with our own Opti-Print™ whiteboard graphics which means that the design is embedded beneath one of the best dry erase surfaces available. And since the design is under the dry erase surface and not on top of it, the surface is smooth and easy to write on and erase, and the graphics will never fade or peel off. 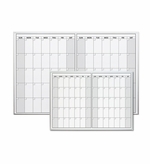 Each boards design has individual day and date boxes that you can fill out and erase month after month year after year, now your schedule will be clear and easy to see. You can choose one of our magnetic receptive calendars and use it with some of our magnetic accessories or you can choose one of our economy non magnetic white board calendars and save some money! Another great idea is customizing one of our calendars with your own personal design or perhaps your company's logo! With a company logo it isn't just a calendar it becomes a branding tool. 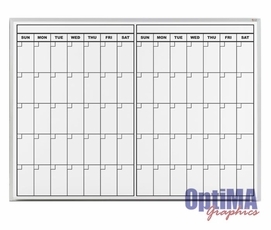 Ordering a custom dry erase calendar is easy and it isn't expensive at all! You pay a one time artwork fee and order your board, there are no minimum purchases and if you order more than one you pay per design not per board, so feel free to order a calendar for everyone in your company! From "Size" "203: 24\" Tall x 36\" W (+$99.95)" "304: 32\" Tall x 45.5\" W (+$199.95)" "406: 4' Tall x 6' W (+$375.00)" "408: 4' Tall x 8' W (+$475.00)"
From "Size" "203: 24\" Tall x 36\" W (+$72.95)" "304: 32\" Tall x 45.5\" W (+$129.95)" "406: 4' Tall x 6' W (+$299.95)" "408: 4' Tall x 8' W (+$359.95)"